So, I was looking through my Ms. Mannquin paper dolls recently and I noticed that I have never done one with blond hair. Ever. Today, Violette is here to fix that. Which makes it sound like I am selling drugs rather than posting paper dolls. 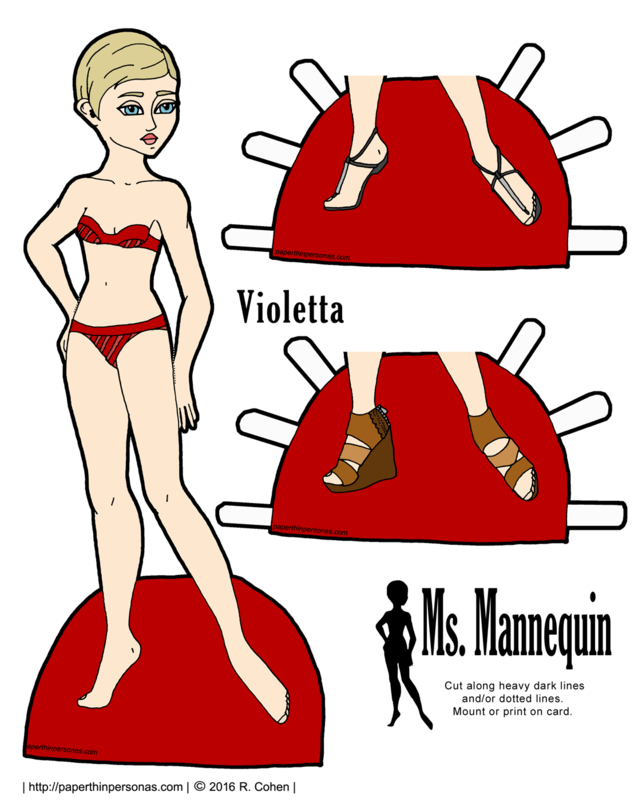 Anyway, Violetta is my answer to the blond Ms. Mannequin paper doll need. I wanted to give her a really modern hair style, calling back to the original “model” idea of the Ms. Mannequins. She can share shoes withe other other Ms. Mannequin paper dolls with fair skin and red bases- Cerise and Natalie. For the rest of the month of January, I am mostly going to be posting material I created in 2016, so the majority is dated with a 2016 copyright date. I just wanted to explain why that was considering that this is 2017 and all that. And, as always, if you love the blog, then donate by join Patreon. And a big thank you to everyone is already is a patron. Ellen DeGeneres has a really unique sense of style, doesn’t she? So glad you like her. When I saw your request, I was like… Oh, I’m already doing that. Yeah, there is something twiggy about her haircut.